We have released yet another downloadable PDF file, this time of “The Davenport Hotel: Historical Walking Tour.” We will maintain corresponding icons in the sidebar menu to view and download this and other handy documents in the future. Another brochure??? And why did we do it? Our other brochure, “Art & Ornament in the Davenport Hotel” was loosely based on the old walking tour, but we chose a historical preservation focus for that one. Afterwards, we had so much good text left over that it seemed a shame to waste it, so we used it on this new walking tour. The two brochures overlap in places, but differ in audience appeal. We won’t claim that our walking tour is the best that anyone could ever do. We just happen to think ours is the most accurate in print. We would dearly love to supply the brochures ourselves, but we do not have the resources to supply the entire public. At least we can offer readers the option of downloading this for themselves on 8 1/2 X 11″ paper. Just remember to click that little print box that says, “Fit to Size” so it will fold correctly. Detail of the “Green Man” from the Marie Antoinette Ballroom. We are happy to announce a downloadable PDF file of our new trifold brochure, “Art & Ornament in the Davenport Hotel.” Click on the brochure icon at the right to view this document. The map icon below that will take you to downloadable PDFs containing maps of the main Hotel areas. We believed the time had come for a more accurate guide to the Davenport Hotel’s features than currently existed. Our brochure includes information about the Hotel’s 2000-2002 renovation, as well as historical information about the art and ornamentation of its interior. We hope to eventually produce an expanded souvenir booklet that will include more detail, anecdotal accounts, and more photos. Until then, we hope this will suffice for the casual tourist, the historic preservation advocate, or even the serious Davenport aficionado. Among the most admired and least understood aspects of the decorative plasterwork in the Davenport Hotel are the heraldic devices on the beams of the Lobby and over the crowns of the elevators of the main floor. All of the shields throughout the hotel originate in history, although they have been redesigned and thinly disguised for a traveler’s fantasy. The Davenport’s architectural decorations depict adventure, trade and commerce, evoking comparisons with the great trading empires of the ancient world, one following upon another. Drawing us through the kingdoms of the European Renaissance, they then transport us from there to the New World, where we eventually end up in the Inland Northwest. Clearly, the investors and developers of the Davenport Hotel saw themselves as the heirs of this historical swell. Although little more than a nod has been paid to the decorative shields themselves, much has been written about the reason for choosing the Hotel’s Florentine facade and the overall scheme of the public rooms. The shield pictured above comes from an elevator crown on the main floor and is a reworked version of the heraldic emblem of the united Spanish kingdoms of Castilla y León (meaning “Castle and Lion,” although the name León seems to have come from the Latin word for “Legion” ). The actual coat of arms depicts a castle with its three towers, rather than a single tower, in opposite quadrants, as well as a rampant lion in the other two opposing quadrants. 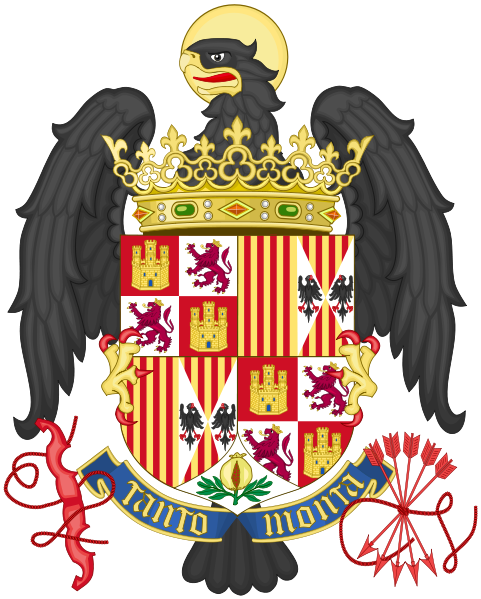 The Visigothic queen, Isabela II of Castilla, inherited that original coat of arms before her marriage to Fernando (Ferdinand) of Aragón, which then united their kingdoms, as well. Although these symbols are common throughout Europe, it is the arrangement of them in the design that evokes memories of the kingdom of Castilla y León (Castile and León). Coat of Arms of the Catholic Monarchs, 1492-1504. English: The quartered arms of Castilla and León appear in the first and third quadrant of the escutcheon. The arms of Aragón and Aragón-Sicily appear in the second and third quarters. The arms are supported by the eagle of St. John and topped by an open royal crown. Source: Menéndez-Pidal De Navascués, Faustino; El escudo; Menéndez-Pidal y Navascués, Faustino; O´Donnell, Hugo; Lolo, Begoña. Símbolos de España. Madrid: Centro de Estudios Políticos y Constitucionales, 1999. ISBN 84-259-1074-9, pp. 175,176. From Wikimedia Commons ((es)). We are presently designing a brochure to cover more of these fascinating architectural decorations and the Hotel’s 2002 renovation. Please check back for updates. This is an interactive 360 virtual tour of the Hall of the Doges. Found in loose papers copied from The Glory Days of the Davenport Hotel (Published by Spokane Corral of the Westerners, 1991) by John Luppert. Luppert was hired as a hotel musician during a musician’s strike that affected the Hotel during the Great Depression. He gives several accounts of a managerial style becoming less and less common in our time. The following is his recollection of Chef Mathieu who headed up the kitchen of that establishment for many years. 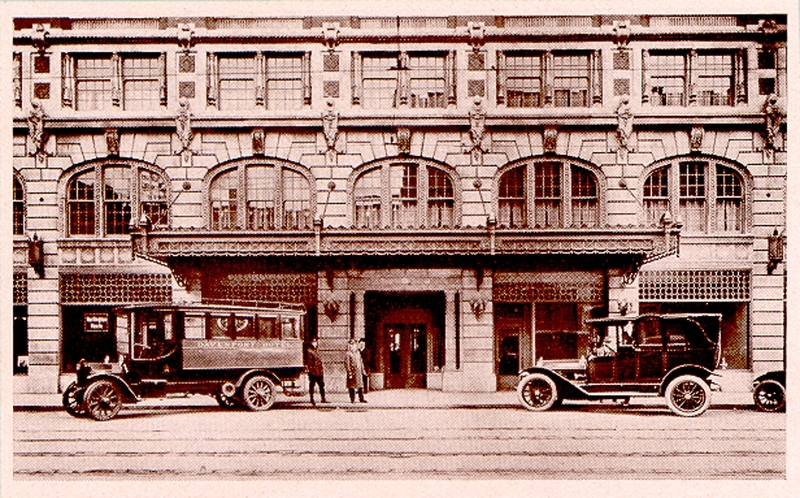 In 1914, the Davenport Hotel published an in-house guidebook and historical walking tour entitled Davenport Hotel, Spokane, U.S.A.: “The Pride of an Empire”: One of America’s Exceptional Hotels. (Its shorter working title is The Pride of an Empire.) The small book, long considered the primary word on the architecture and decor of the building, was written in such a way as to educate the public about the historic influences brought to bear upon the various styles chosen for the public rooms. Clearly, the hotel’s exterior design mingles a resemblance to the Florentine palaces of a previous financial empire with the best of Chicago architecture befitting such progressive times. The architectural symbolism of helmets, serpents, rams’ heads is informed by an understanding of Classical metaphor. Few good closeups of the hotel’s exterior details exist, and it is exceedingly difficult to capture them all in a single shot. The picture above, shows a longshot of the building exterior. Just above the second floor cornices the helmets atop the rams’ heads can be seen (though these latter are perhaps best viewed from the side). For a fuller description, we turn again to The Pride of an Empire. Standing in bold relief will be seen the closed helmet, suggestive of protection, and the ram’s head, which in the classical symbolism is the emblem of push and determination. Overtopping these heads, on the keystones breaking the lines of the cornice, are duplicated Hermes’ staff and entwined serpents, bringing to mind the mythological tale of how Hermes or Mercury, the patron of commerce, travel and what-not, coming one time upon two serpents apparently bent upon annihilating each other, threw between them his staff. Whereupon, we are told, they entwined about it, and themselves, and continued ever after to exist in friendly rivalry. 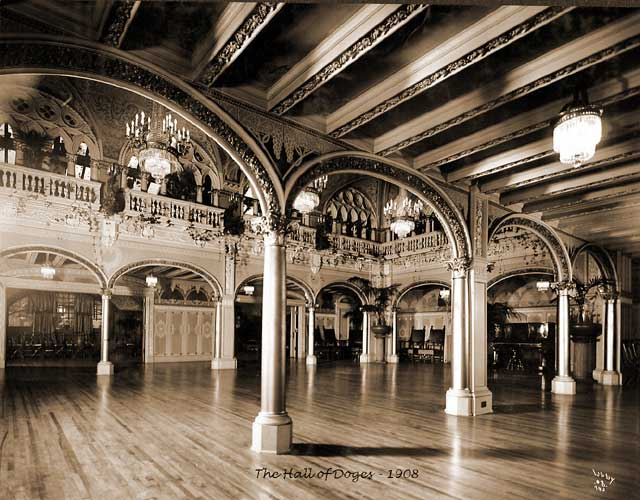 One of the most beloved historic rooms in the Davenport (and indeed Spokane), the Hall of the Doges, was built directly above the famous Davenport’s Restaurant a decade before the adjoining hotel opened in 1914. Architect Kirtland Cutter was asked by Louis Davenport to “spare no expense” in designing a ballroom and reception hall that would “eclipse in luxury and splendor anything of its kind west of the Mississippi.” Such was the prosperity of the great “Inland Empire” that flowed into its capital city, Spokane. 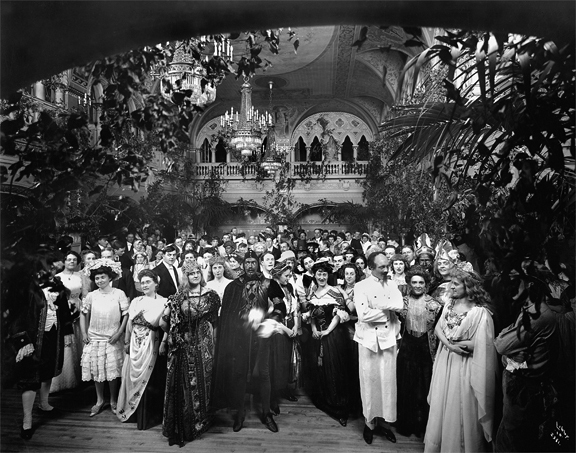 A sense of its gorgeous and festive atmosphere can be derived from the costume ball photo from 1910. 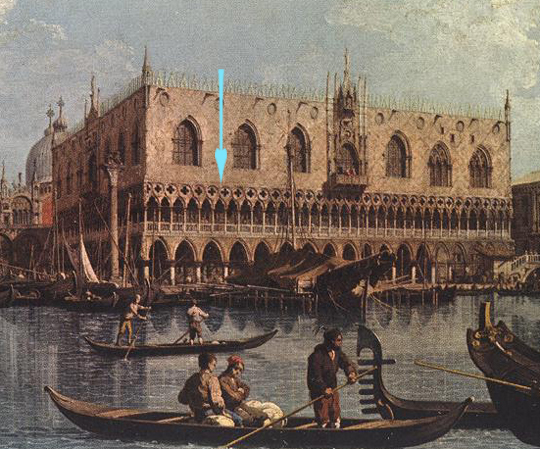 Cutter’s original inspiration for this lavish chamber derived from the famous Palace of the Doges in Venice, most notably in the quatrefoilwindows and Gothic arches on the second stories of each structure. One is tempted to wonder if a Venetian theme was selected because Venice in its days of glory was the heart of a vast mercantile empire, analogous in a way to Spokane in 1904, which was at the flourishing crossroads of the vast Inland Empire. By 2000 the former glory of the Hall of the Doges was drastically eroded. The arches had been closed and covered with red flocked wallpaper; the room felt small and claustrophobic. 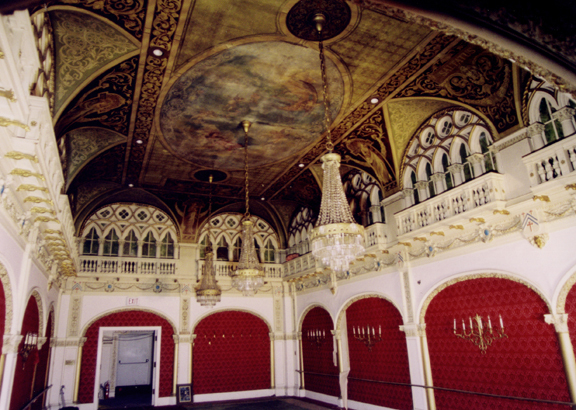 The arms of the chandeliers had been stripped, the ceiling covered with grime, the oval painting severely abraded, and there was a gaping hole in one corner.